When life gets complicated, you can recall the uncomplicated notion that God loves you. This plain white gold cross pendant from Apples of Gold is a reminder of that promise and pretty one at that. The cross pendant is made of the highest in 14K white gold precious metal for a quality piece through and through. Plain but powerful, this gold cross pendant is free of filigree for the finest finish. Keep your life simple with a cross pendant that promises to stay beautifully uncomplicated. 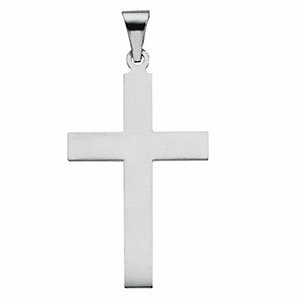 We guarantee our Polished Cross Pendant in 14K White Gold to be high quality, authentic jewelry, as described above.